Established in 1957, we are heading towards 60 years in business demonstrating our commitment to quality and service. Jarrett’s has been family owned and operated since 1989. South Australia’s largest and only locally owned IPA (Interior Plantscape Association) accredited indoor plant hire company. New modern offices and specialised warehouse, and plant nursery with shadehouse and hot house facilities. Australia’s only indoor plant hire company which is a registered training authority (RTO), specialised in the training of staff specifically for indoor plant maintenance. Jarrett’s specialise in vertical wall installations. 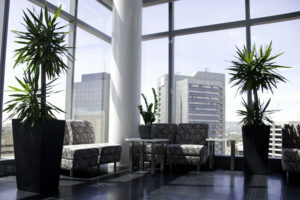 Our vertical wall planters can be extended horizontally and vertically to almost any size. These vertical wall were installed installed onto an external tilt-up concrete wall and fitted with a programmable bluetooth timer with the irrigation concealed under the timber deck and behind the plant wall. The wall is now completely self irrigated and easily adjusted to the water requirements during the seasons. 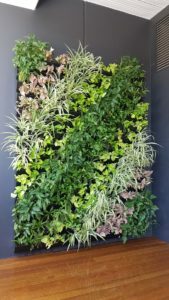 This fantastic new wall design offers a simple solution when replacing plants as the plant pods are easily interchanged when required. Other vertical wall designs water from the top with the problem that the top plants are left dry and the water runs out of the bottom. Our solution has a fully self contained water reservoir to evenly water the entire wall. These vertical walls are ideal for both indoor and outdoor applications.